Application: Using for lighting up the entire car interior, plug and play. High quality RGB LED strip lights, waterproof, anti-collision, anti-corrosion. LED lights Color: Red, Green, Blue, White, Orange, Yellow, Cyan, Purple. Technology: COB. Canbus error free COB technology. 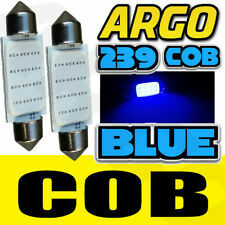 COB is a super chip which has a multi LED light engine in on light module. Beam pattern: 180°. Colour: Blue. Important notice: The compatibility chart above is for guidance only. NEOLUX 36MM C5W FESTOON BULBS LED - NO. PLATE, INTERIOR LIGHTS ETC. Features: Wireless music control 7 color RGB car interior lights kit. High quality RGB LED strip lights, waterproof, anti-collision, anti-corrosion. Wireless IR control, change the color as you wish. Also sound-activated allows you enjoy the fun with the color changing following your car stereo music rhythm as well as your voice Control mode: 16 signal color control, brightness control, ON/OFF, 2 jump mode control, 2 fade mode control Application: Using for lighting up the entire car interior, plug and play. With 3m sticker on the back of the light, easy to install. Note：When remoting ,pls put the remote contral towards the receicer with no barrier about it . Ford Mondeo Mk4 2007-2014 9pc 6000k White LED Interior light conversion kit. Give your Mondeo the LED lighting it deserves. LEDs are polarity sensitive. If at first they do not illuminate simply remove, turn through 180° and refit. Suitable for : H7. Modified Car, Trunk, SUV, RV HID Xenon Headlight, ALL IN ONE Style, no extra driver needed. 2 H7 LED headlight( Each bulb has 2 pieces of high power COB LED ). Long range：6000K color temperature and 200m light range. W204 C-Class 2008-2014 SEDAN(Fit 4 Doors Only). When you open the door, you’ll see a LED light projection welcoming you which emanates charmingly. Super Bright LED and SMD Technology. Low Temperature and Power Consumption Saving. XK 2006-2014. XJ 2004-2015. it is exact fitable light and you can just take out the old light on your car then insert it wihout change wires or drill hole. High Brightness LED, Power Consumptions Savage. Performance Race Parts. Part Number H4HALOGENAP. 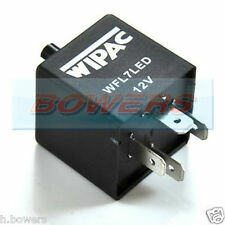 H7 LED 50W LOAD RESISTORS CANBUS ERROR FREE HARNESS CAPACITOR 6 OHM 12V. 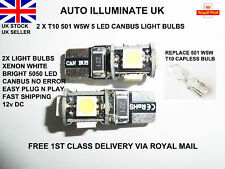 2 X 4 SMD 41 mm C5W CANBUS NO ERROR XENON WHITE FESTOON BULB. Base type: C5W Festoon. BUILT IN LOAD RESISTOR NO ONBOARD OBC ERROR CANBUS FRIENDLY. 2 x 41 mm Festoon light 4 smd 5050. The energy of LED is 1/10 of the traditional halogen lamp, it can help save fuel. For AUDI A4 98-05, A6 98-05. -Type: Side Marker Lights. A Pair of left and right Side Marker Lights. -Color: Smoke. Give your vehicle an updated, more aggressive look! -Part Number: 8E949127. -Lens Material: Plastic. Land Rover Defender 110 90 tdi Extra Bright White 12 LED SMD Interior Courtesy Light Festoon Bulb. New HIGHER QUALITY with 12 LEDs. Fit Models : Mitsubishi Delica D:5 2007-2014 (NO Sunroof). Easy Plug and Play installation, takes 5-10 minutes to replace. 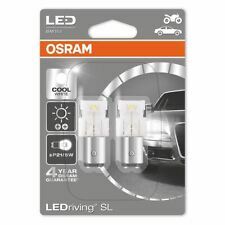 Low power, brighter LED bulbs that give you a different look on your car. Luggage Light X 2. All backed by our 12-year limited warranty. Interior lighting: 6000K Bright white light. Red intense light for stop/tail and 6000K white light for back-up applications. 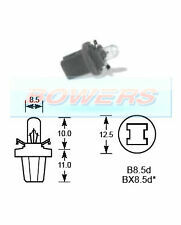 Replaces 194, 168, 12961, 158, 161, 193, 579, W5W bulbs. EVO Formance LED Ultrabrights are brighter than neon. LED Ultrabrights use super high output flat LEDs that radiate intense 180 degree illumination with no hot spots. 1 X EVO FORMANCE 4" ULTRABRIGHTS WATERPROOF FLEXIBLE STRIP NEON WHITE. 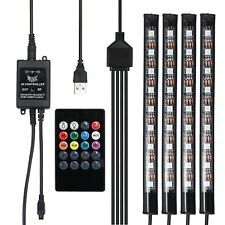 4 In 1 48 LED 12 LED X 4 Stripe Car Atmosphere Lights Interior Strip Lamp Cigarette Lighter Plug Waterproof. Security and stability, cigarette lighter plug built-in fuse, always protect the car circuit! Categoria Fari, Frecce e Luci. 509T DASH LIGHT BULBS. 20MM IN LENGTH. Technology: COB. Canbus error free COB technology. COB is a super chip which has a multi LED light engine in on light module. Beam pattern: 180°. Colour: White. Important notice: The compatibility chart above is for guidance only. Chrysler 300c 2005-2018. plug and play / NO DRILL ANY HOLE NEEDED. it is exact fitable light and you can just take out the old light on your car then insert it wihout change wires or drill hole. High Brightness LED, Power Consumptions Savage. Part number: 9201645. Donor vehicle- BMW 3 SERIES E92 335i 2011 RHD. RHDrefers to part from right hand drive vehicle (found in UK, Australia and others). Year - 2011. Body type - Coupe. Our consultants can also be reached on Skype. LUCI TARGA MULTILED CON RESISTENZA INTEGRATA. PEUGEOT 308 e 208. attacco T10. Tipo di lampadina T10. Tecnologia LED. Condizioni Nuovo. Categoria Fari, Frecce e Luci. Ristring di aggiungermi all'elenco dei preferiti ! 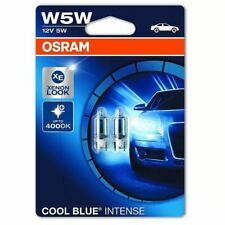 2 X T10 501 W5W LED WEDGE XENON WHITE CANBUS LIGHT BULBS. Part Numbers: 501 W5W T10. Colour: Xenon White. Bulb Type: Led. Led Type: 5050 Led/Smd. Length 27mm. E Marked: No. Polarity: Yes. We have tested these resistors on all of our LED Products. We can not gurantee these will work with other LEDS bought from other suppliers. Very simple to install. Simply pull out your old bulb connect one end of the resistor in and push your LED bulb in the other and refit. 6 Series E63 E64 LCI 2008-10. 3 Series E90 E91 LCI 2007-10 (Must have factory fitted xenons). 5 Series E60 E61 LCI 2007-10 (Must have factory fitted xenons). 40 Watt CREE (20W EACH SIDE) MULTICOLOUR CHANGE Series LED angel eye upgrade bulbs. Citroen Dispatch MK3 / Peugeot Expert MK3. With my instructions you get a full detailed step by step guide on how to fit and wire this into your van will be very similar for other vans and anyone with any basic electrical knowledge should be able to use them as a guide to fit on a different model. 1x Lucas LLB346 Bulb. GENUINE LUCAS 21w 24v Ba15d SBC LIGHT BULB. Bayonet Fitting. Bora all models including variant and 4 motion 1999 - 2005. Pair of quality Standard Clear side indicators. VW Golf MK4 all models including variant and 4 motion 1998 - 2001. Golf Cabriolet 1999- 2002. WIPAC S6015. 1 PAIR complete with 100w 12v H3 bulbs and stone guards. Bulbs H3 100w. Stainless steel body. Plastic stone guards.